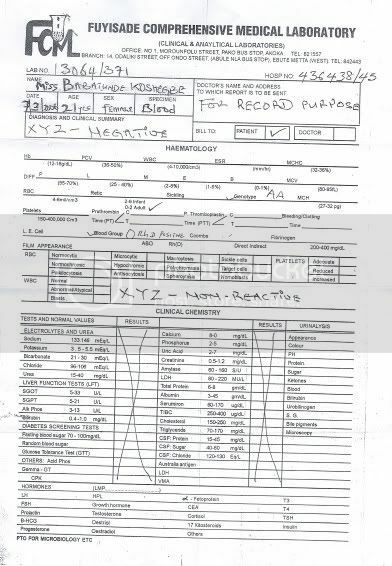 this is her HIV test apparently, as I will be flying to Lagos for a weekend of fun I wanted to make sure she was emm clean. HIV free? You won't have anything to remember her by! What a shame. Maybe if you should tell her you have it- ask if she minds getting it. I plan on making up a smiliar medical statement/form which will include mailing a stool sample to an ficticious labratory. Not a good idea. The general theme is to not mess with any innocent third parties here. That poor postal worker would be the third party. I thought the laughing face would indicate I was only kidding. Sorry, next time I will be more explicit. If she's not allowed to mail it, she'll have to take it there herself! Of course. Maybe you could have an icon of a safari hat sitting on a toilet.